Apart from Catherine Keener’s straight-up bone-chilling performance in the hypnotism scene, my favorite thing about Get Out is its final scene. In particular, how it’s a perfectly-realized horror movie moment. The premise of Get Out would’ve fit in perfectly as an extended sketch on Key and Peele, but it would’ve been mostly forgettable. Presenting it as a horror movie — even a satirical one — is crucial to giving it depth, because of the play between empathy and distance that’s a key part of horror movies. You spend most of a horror movie identifying closely with the protagonist while simultaneously reminding yourself that that’s not you. And in fact, its frustratingly not you, as you’re forced to watch a character making stupid decisions that you wouldn’t make yourself. 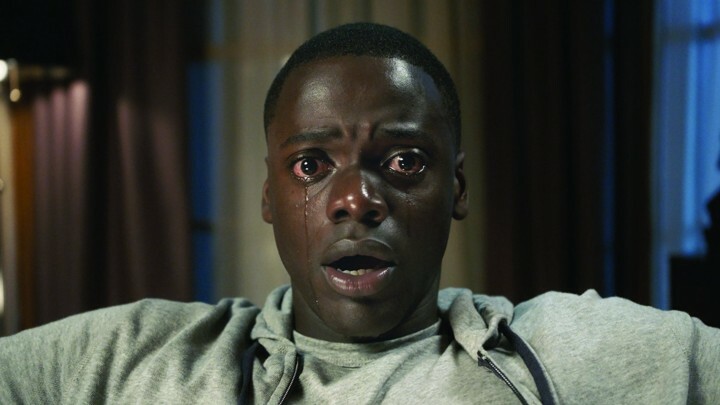 Peele has said the title Get Out was a reference to how black audiences watch horror movies in theaters and scream at the main characters to get out of the murder house. Winston Duke has said the same thing while promoting Us, but I think it’s a universal part of how all audiences process horror movies, even if we’re not all equally vocal. So at the end of Get Out, we’ve been right with Chris as he goes through hell trying to escape the house and get past all the surviving Armitages in one form or another. Normally, at this point in a horror movie, there’s a huge sense of relief as the monsters are all dead and the protagonist has survived. The worst that can happen is the sudden jump-scare reappearance of the bad guy who wasn’t actually dead, and as much as I like the potential image of Steven Root lumbering around with his skull open, the movie has already proven that it’s above cheap stunts like that. In fact, horror audiences know better than to leave a villain still alive, and Get Out knows that we know that. So Chris goes to finish off the still-breathing Rose, and it seems necessary. But as soon as we get a shot of a black man over the body of a white woman, strangling her, we’re instantly reminded that this is a horror movie where the usual roles are reversed. Any sense that the threat was over and he’d be rescued is immediately replaced with the dread that things can only get worse. So when a police car shows up, the audience is immediately split. All of us white viewers are instantly reminded that we’re not Chris, no matter how much we’ve been identifying with him and rooting for him to make it out okay. We’re reminded viscerally that the thing we associate with safety is inescapably seen as a potential threat to non-whites in America. The movie shows us Chris and Rose’s faces, and they both instantly get it: for her, it’s relief, and for him it’s resigned dread. I think it’s something that we all think we understand intellectually, but don’t fully get it until we’re forced to empathize with someone who can’t see the police as rescue. (And who’s been told his whole life that that’s just the way it is, and it’s not really a problem). I thought the final reveal was key: horror movies are all about anticipating the audience’s expectations and then subverting them. Rod is the one person in the world who could see that violent scene and really understand it. He’s been the audience surrogate the whole movie, saying out loud all of the conclusions we’ve been jumping to as we’ve been trying to figure out what exactly was going on. I thought it was the perfect way to bring everyone in the audience back together, and a masterful final stroke for a genre that depends on being able to read and predict an audience. So I was super disappointed to learn (while Google searching for an image from the movie) that the ending wasn’t the keystone of the script, and that an alternate was written and shot. (And presented on the internet with commentary from Jordan Peele). In the alternate ending, it is the cops who show up, and they do arrest Chris, and he is hopelessly trapped in prison — filmed in a long line of other black men in prison — with the only consolation being that he knows he put an end to the body-stealing scheme. Which, granted, is probably a more realistic ending (albeit “realistic” in a movie which involves a body-stealing scheme) and is probably the gut-punch that complacent audiences need to see. But I would’ve hated it. And even knowing it exists lessens my appreciation of the movie somewhat. The thing that disappoints me isn’t that the alternate ending is bleak, but that it’s so predictable. The constant interplay between what you expect to happen and what actually happens is crucial to a horror movie; it’s the spark that makes them work. The cinematic cut of Get Out ends with a long sequence of set-ups and subversions that starts with Chris’s escape from the basement and just keeps building on itself as images are called back one after the other. The deer head, the tea cup and spoon, the car and the knight helmet, the grandparents, Chris’s inability to kill the wounded deer. It’s exhilarating because it’s like a volley between the moviemakers and the audience: I showed you this, you assumed that, it finally pays off with this, which leads to that….